Due to the abundance of salmon returning to the Lower Fraser River fall is the most exciting season for Vancouver and Fraser Valley anglers. Not only are there different river systems to choose from within an hour drive from your residence the chance of catching fish is high. Several main systems in the Lower Fraser River, including Chilliwack/Vedder River, Harrison River, Stave River and North Vancouver’s Capilano River have a strong hatchery salmon program, which provides opportunities for anglers to keep fish. There are also smaller systems with fishing opportunities. The best way to find out where these are available is by checking the regulations and see which rivers are listed in the quota table. Three main species can be targeted. Starting in September, Chinook salmon begin showing up in the systems and the run usually tapers off in mid October. Coho salmon are also found in September, but the run is at its peak from early October to mid November. Lastly, chum salmon can be targeted throughout the months of October and November. In some systems, fresh coho and chum can be caught into the early part of December. These salmon species can be caught using a variety of methods, but float fishing with freshly cured salmon roe is often the most consistent way to catch them. 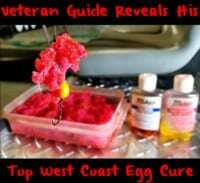 My favourite cure to use is Red Fire Cure, as I like my eggs to be as red as possible. Properly cured eggs can be stored in the freezer for a long period of time. In fact, most of my bait are from the previous season. Personally, I like to wrap my skeins of roe in Saran wrap once they are cured and dried. They are then frozen for 24 hours before being vacuum packed and stored in the freezer. I take them out a day prior to fishing and thaw at room temperature. Coho, especially in heavily fished systems, can be finicky and hard to entice. Generally, early morning is best. This is especially true in the early part of the season when river level tends to be low and water tends to be clear. Coho salmon are often found in shallower parts of the river such as tailouts and covered spots such as log jams where they are not disturbed by larger Chinook salmon and frequent angling activities. Chum salmon are usually easy to find throughout the entire river system, but to target the freshest fish, particularly in the later part of the season, you should focus on the lowest part of the river. Chum salmon bites are not time specific. Placing the bait in front of them anytime of the day can usually trigger bites. 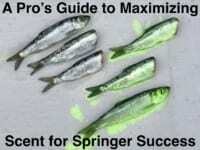 This makes them the most beginner-friendly species for those who are just getting into river salmon fishing. Before heading out, be sure to check the regulations and updates on any seasonal closures, gear restrictions and daily quotas. Every river system is managed differently so it is important to be aware of the rules, which are set out to ensure the sustainability of these fisheries. Updates on fisheries around Metro Vancouver and Fraser Valley can always be found on our website and Facebook page. Editor’s Note: For more info on Fishing with Rod please visit http://www.fishingwithrod.com.